Embroidered Christmas Elmo - 12"
Stay warm and cozy with Elmo this Christmas season! 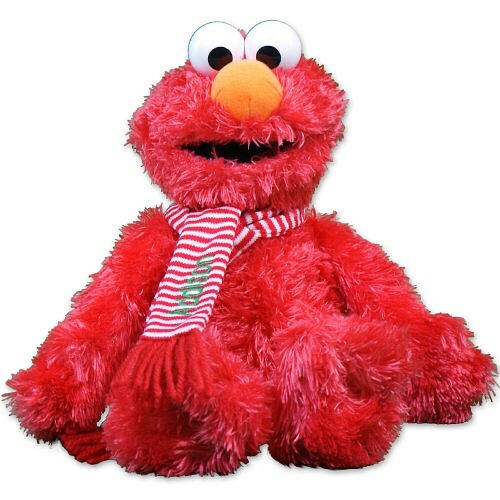 Elmo is wearing a festive scarf, embroidered with any name, and is ready to celebrate this wonderful holiday. Let Elmo become an instant favorite among the whole family. Elmo is filled with beans at the bottom to make the perfect sitting pal. Along with the super soft , silky fur, Elmo measures approx. 12” and wears a red and white striped scarf. Free personalization of any name is included. Free Gift Wrapping and a Free Gift Card are included to create a thoughtful presentation. Additional Details Christmas is a wonderful time to celebrate with close friends and relatives. Commemorate this special time of year with Plush Christmas Animals from 800Bear.com. Our collection of Christmas Stuffed Animals are unique keepsakes to always enjoy. You'll also love the look of our Embroidered Christmas Dog & our Christmas Penguin as well.